If you have followed along, you know we stayed in Phuket for 4 day, which was considered to be WAY too long and the biggest mistake we made during the whole Thailand trip. Seriously think 2 days would be enough. 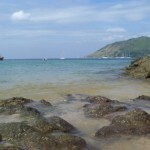 You can find out the reason by checking out what’s fun and what’s not fun in Phuket. 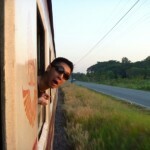 As usual, we have some travel tips and a few recommendations for you. 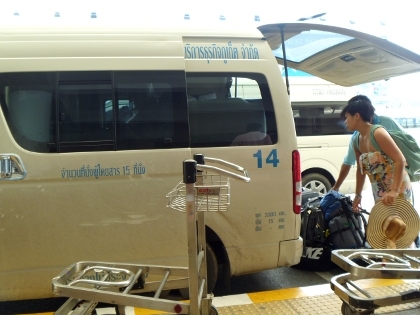 Phuket International Airport (HKT) is located at the north of the island. The total area of 7,257 square meters for the international passengers terminal 1 is relatively small. 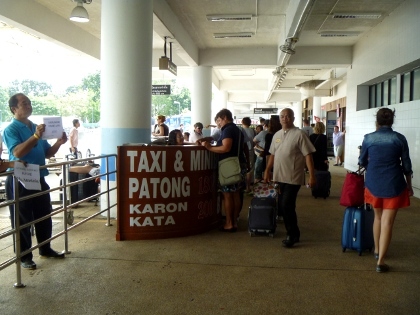 After landing in Phuket International Airport, if you are not going to be picked up by your hotel, go directly outside of the terminal, there are a couple of taxi/minibus service counters that you can’t miss. The minibus which is also called joint minitaxi (a van) will gather passengers together and drop them off respectively on the way based on where the passengers want to go. 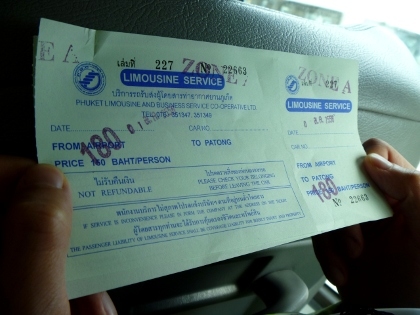 Flat fare is 180-200 bath per person depending on the distance. If you know how to ride a scooter, then renting one can make your transportation very easy since the tuk tuk and taxi rip-offs in Phuket are pretty infamous. Rental fee is 200-250 baht per day and you will need to provide your passport and a deposit. We suggest you rent a scooter from a trustful hotel and better to rent one in the morning because scooters are in great demand. They are usually not available if go after lunch. 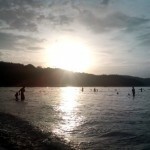 Other than beach hopping and Bangla Road at Patong Beach, we would also recommend some place to eat if you happen to stay in Patong Beach area as well. 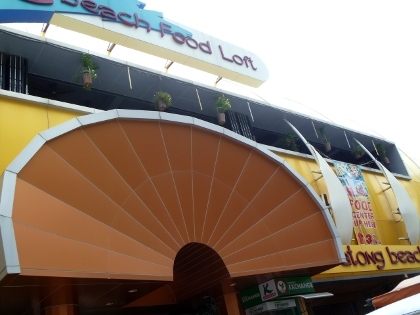 It claims that @Beach food loft, 3rd floor in Ocean Plaza on Thaweewong Road at Patong Beach offers the cheapest food in the area which is absolutely true. 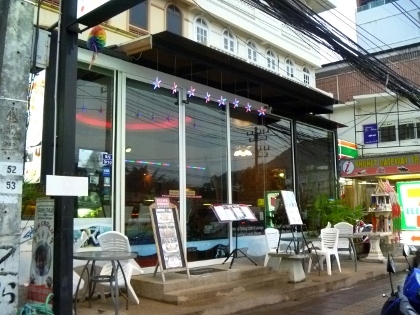 This food court contains about 12 food counters mainly selling Thai food and one restaurant facing the ocean. For the price, this food loft provides great food value! 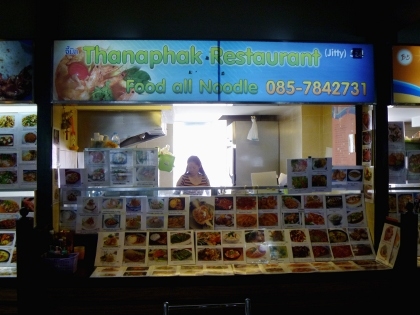 We often ate at the below counter during the 4 days staying in Phuket. Pad Thai Noodles and Fried rice with shrimp were what we always ordered. 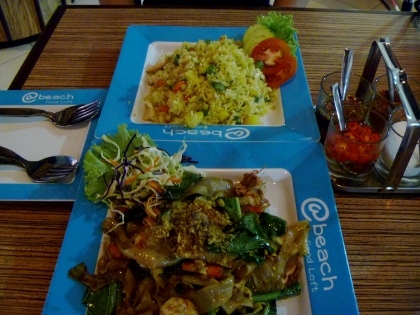 The food tasted great and the portion size was very satisfactory as well. That’s 100 bath for each. Great deal! Dinner at this restaurant was a very interesting experience. We actually found this restaurant on TripAdvisor. 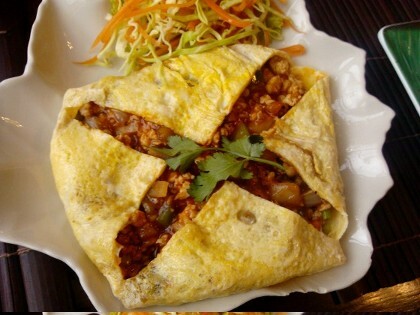 According to the reviews, it seems that most of the reviewers got weird feelings about the restaurant’s decoration but great experience with the delicious food and excellent service. So we decided to give it a shot. Entered the restaurant, we were warmly welcomed by the manager and staff. Atmosphere was very good. We chatted with the restaurant manager when he was taking our order. He’s from Singapore and speaks perfect Mandarin. All the staff were male and they were extremely friendly and detail oriented, also good looking too. There were a couple of framed photos displayed at the reception desk including a dog’s photo. We sensed that something was different there. Out of curiosity, we checked out their official website, turns out that Club One Seven is a gay owned and gay managed company. 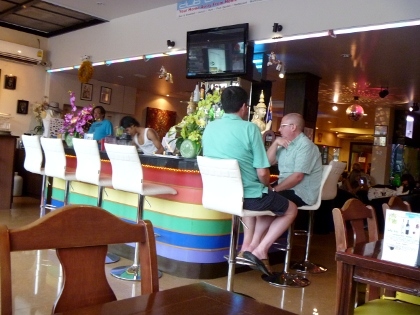 Service includes dining and cafe, tours and accommodations which is GLBT orientated boutique guesthouse in Phuket. All of sudden, things made a lot sense! No wonder there is a rainbow bar in the middle of the restaurant. Foodwise, very very tasty! Be gay friendly and you will have an amazing experience there!